Plotts Law Firm is a Houston based immigration litigation focused law firm that takes pride in representing its clients looking to deal with matters relating to immigration, as well matter involving immigrants accused of criminal offenses. 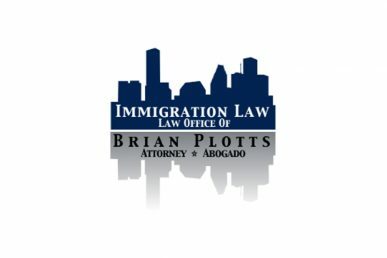 Searching for a respectable Houston immigration lawyer can be a tough task, which is why we’ve listed attorney Brian Plotts as a go-to attorney for matters involving permanent residency, green card services, legal immigration, and criminal defense for immigrants/people who are not naturalized American citizens. The legal team at the Plotts Law Firm includes board certified immigration attorney Brian Plotts, and attorney James Parker. Both of these men are experience litigators when it comes to matters involving criminal defense, dealing with Immigration and Customs Enforcement, and U.S. Customs. Looking For an Immigration Attorney in Houston? Call 713-626-8822 as soon as possible to schedule a free consultation with attorney James Parker and Brian Plotts so we can begin to work on your case. Our office is located in southwest Houston, and we are always caring and passionate when it comes to helping immigrants reunite with their families, or stay with them. Also, keep in mind that attorney Brian Plotts of one the best attorneys for immigration matters considering he is Board Certified as an expert in immigration law as declared, and certified, by the Texas Board of Legal Specialization. With over 20 years of experience, we can help.